Hennessey Performance has the perfect Christmas gift for the performance enthusiast, a 10.82 second 2013 HPE700 ZL1 Camaro. If you are a fan of high performance, you’ll be drooling to have the new 2013 HPE700 ZL1 Camaro from Hennessey Performance. This is the same team out of Sealy, Texas who took a stock 2013 Cadillac CTS-V and turned it into a 1,226 horsepower rocket that set a world record 220.5 mph on Texas State Highway 130 back in October. John Hennessey has been making “fast cars faster” since 1991 and knows how to build fast cars like no other on the planet. Now Hennessey Performance has taken a stock Chevrolet Camaro ZL1 and built the Hennessey 2013 HPE700 ZL1 Camaro with a few performance upgrades. The team took the HPE700 out to Lonestar Motorsports Park which is 38 miles from Houston for a quarter mile test run. The Hennessey modified Camaro Zl1 ran the quarter mile in just 10.82 seconds with a trap speed of 131 mph. 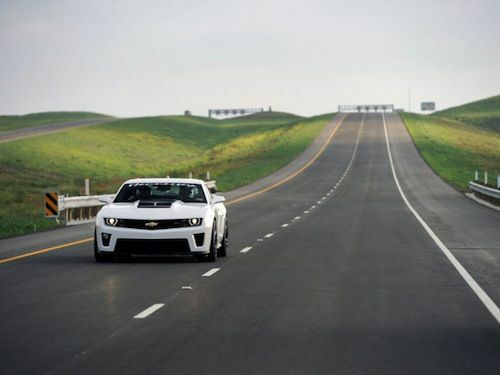 In the video below, you can almost feel just how fast the 707 horsepower ZL1 really is. intercooler heat exchanger upgrade, fuel system upgrade, 160 degree thermostat and all necessary gaskets & fluids. The professional team out of Texas provides everything for the performance enthusiast who wants the ultimate performance ZL1 Camaro. The car is turn key and the comes ready to roll onto the dragstrip. The Hennessey team provides HPE engine management calibration, and dyno tuning and road testing before the customer ever takes delivery. The HPE700 ZL1 also features Hennessey exterior badging, premium floormats, serial-numbered dash and engine plaques and comes with a 3 Year / 36,000 Mile Limited Warranty. The Hennessey 2013 HPE700 ZL1 Camaro is the perfect Christmas gift for the performance enthusiast in the family and is available for immediate delivery. The new ZL1 comes ready to run the quarter mile in 10.82 seconds and can be purchased for $84,500. You can get more information on the Hennessey 2013 HPE700 ZL1 Camaro and other performance vehicles by contacting John Hennessey at 979-885-1300.